Gunn Vik and Adhemar Freire, both representing NORWEP. In an exclusive workshop for Norwegian companies, Petrobras disclosed a long list of needs the company hopes that Norwegian suppliers can contribute to meeting. 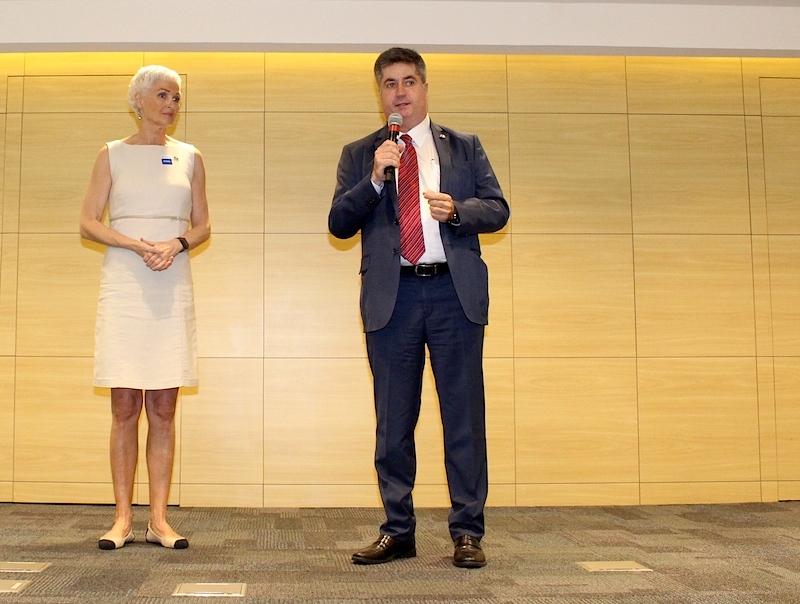 The workshop took place in an Petrobras auditorium in downtown Rio de Janeiro on April 13, 2018, and was the result of an initiative taken by Norwegian Energy Partners. 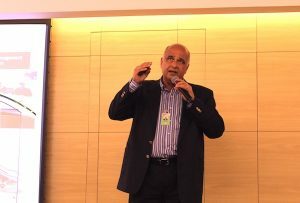 The Petrobras Business Plan for 2018-2022 and the new rules for bidding and contraction were presented in detail to the participants. A special focus was dedicated to the Marlim Field, and several Petrobras managers expressed the will to see many Norwegian companies on the Petrobras vendor list in the years to come. «We are pleased that Petrobras takes the time to meet Norwegian suppliers. We have had a good cooperation for many years, and many Norwegian suppliers are present here. We can bring a lot of good competence to the table, as well as cost efficiency», Norwep Regional Manager Gunn Vik said in the opening remarks to the event. Norway´s Consul General Sissel Hodne Steen was also present. «We are happy that Petrobras invites Norwegian suppliers to listen to you and understand better how to cooperate with you. Petrobras is a very important actor for Norwegian industry in Brazil», she stated. Supply chain development manager Guilherme Pamplona then gave the first presentation to the seminar, on the organizational chart of Petrobras, to familiarize the Norwegian stakeholders with the Petrobras executives and place them in the right departments. He also talked about the Petrobras supply structure. According to the current business plan, Petrobras plans to invest 74,5 billion USD the next five years. «There are lots of opportunities on the OPEX side, and Petrobras is working to develop suppliers relations. The strategy is to expand the scope of existing suppliers, attract new suppliers and reduce entry barriers», Mr. Pamplona said. He also gave several examples of needs that Petrobras will have to meet with the next few years. 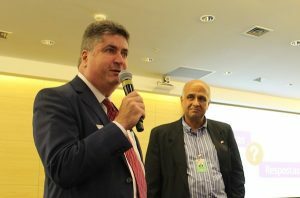 «We are working to identify suppliers abroad that could be interested in establishing in Brazil, and we would like you to help us», he said. Future decommissioning projects will probably also represent business opportunities, and Eduardo Zacaron presented the plans for the Marlim Field. Brazil will face a large number of decommissioning projects the next years. «Decommissioning requires differentiated operational solutions. Currently we have 5-6 ongoing projects», he said. Eight of the nine platforms will leave the Marlim field in the period from 2021-2024. The Brazilian decommissioning scenario involves large water depths, large equipments, an extensive use of flexible lines and umbilicals and a large number of subsea wells. The needed logistical infrastructure is not in place yet, and the environmental scenario is described as highly sensitive. Mr Zacaron received many questions from the audience throughout his presentation, and the decommissioning topic was clearly of great interest to many of the participants. «We need to minimize the time between production ceasing and the towing of the floating unit from location. The main challenge is however the decommissioning of subsea systems. There are currently no regulations in place telling us what needs to be removed. As for Plug & Abandonment of wells, Petrobras will be looking to reduce cost with new technology, integrated resources and optimized logistics. We are also considering separating the three phases of the decommissioning process to gain scale and mitigate risk. As for the subsea systems we are working to involve stakeholders with international know-how, and we are working with the regulatory bodies to develop guidelines», Mr. Zacaron said. Mauro Martins Palmeira gave a slightly different presentation on the Marlim Field, focusing on revitalization. Production started in 1991 and in 2016, the concession on the field was extended until 2052. The Marlim Field is Petrobras´most productive fields with a peak daily production of 600.000 barrels per day back in 2002. Current average production in 160.000 barrels. In 2017, a redevelopment plan for the field was approved, and this year, a tender for the chartering of two new FPSO units was published. These two production units will replace the 9 current units on the field. «This is a pilot project for Petrobras, the first of its kind. Production start on the new units is 2021. The subsea needs are big. 10 new production wells will be drilled, and we also plan to relocate 40 production wells and 35 injection wells. We plan for the new project to minimize the environmental impact on corals. Pipelines and installations have to have a minimum distance of 10 meters to the corals», he explained. The last part of the dynamic event was dedicated to the new bidding and contracting rules that Petrobras is adopting. By May 15, 2018, all Petrobras departments will have adopted the new rules. New criteria apply in the selection of suppliers ad in the following steps of the contracting process. Suppliers that Petrobras has attributed a high integrity risk, will not be allowed to participate in contract procedures. There is no longer need for pre-qualification of suppliers to participate in tenders, provided that they comply with the qualification required for such specific tender. Petrobras will carry out the prior qualification of companies that are able to provide services or goods. 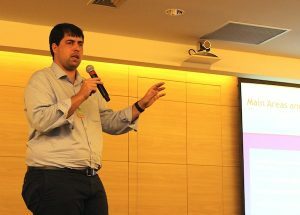 But according to Guilherme Pamplona, it is an advantage to be qualified in advance as Petrobras supplier in the process.